Whether you are a first-time home buyer, someone interested in buying a bigger home, downsizing or even someone who is moving and is looking for their next home, there is always the question of whether you should buy an existing home or build one. 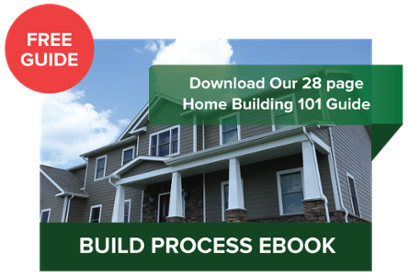 Regardless of which you choose, the home buying/building process can be the largest investment a person makes in their life. With that in mind, those asking what to consider when building a home (in the Morgantown area) need to remember that they should be truly happy with their home. When considering building or buying a home, you will most likely come up with your own pros and cons list for each side and see all pages online that discuss this matter as well. Both sides, building or buying, have plenty of pros and cons that can make it difficult for customers to choose from. There is a trade off when deciding which route to take, and that is convenience versus customization. Whereas in buying an existing home, there are a couple factors that go into the pricing. Customers often assume the listing price is exactly what they will pay, where in reality there are repairs and remodeling that will be done. Repairs can get costly but usually not as costly as remodeling. These prices should be included in the existing home price, which can easily end up costing the customer more than had they just built a new home. There are pros and cons when it comes to buying an existing home on the market. Some of the negative aspects of buying a home is that you may not get everything you want. There will always have to be at least a little compromising whether that be the buyers side, the sellers side or both! When buying a home, customers can run into the issues of finding the right house in the right location. For example, someone might find a home that they really like but it may not be in a good location for them. On the flip side, someone may love an area, such as a neighborhood or community, but not be able to find a home that they like within it. Another negative aspect of buying a home might be that there are maintenance issues that need to be dealt with. This usually comes with older homes, where issues like outdated features can come up as well. The remodeling, as previously mentioned, can get expensive on top of already of purchasing the home. As for some pros for buying an existing home, there are a few that usually are the deciding factor for some in the home buying/home building process. A big one is less stress because even though stress is inevitable in the home buying process, there is much more that goes into building a home. Buying a home can reduce the amount of stress as well asthe amount of time. A positive aspect of buying a home is that the amount of time it takes to move in is far less than that of building a home. The amount of stress and time are the big factors and are what make up the majority of the convenience side of the trade-off between it and customization. With a brand new house, the customer is going to get a few things that an existing home cannot offer. One thing is that they get to customize their home to suit their preferences, wants and needs. This home will be a fresh start, and they will be the first owner. This means their new home will offer modern features and finishes along with not having to worry about repairs anytime soon. Even if there is an issue that needs repaired, it will be covered and fixed with the warranties that come with the new appliances and features in the home. Some features that come along with a brand new house are energy efficient materials that can save homeowners quite a bit over a time. Choosing to build rather than buy an existing home can give them a better quality house. As for some negative aspects for building a home, there are only a couple that really effect the customers. One is that the time it takes to build a home is usually in the 4-6 month range. This time frame changes depending on a couple things, like how quickly a house can get access to power, how well the weather cooperates during the building process, and if the customer makes changes during the process which require a halt on moving forward, or even having to backtrack some to fulfill the customers change request. Vision Homes believes that as one of the largest investments in a person’s life, it should surpass all expectations at all levels of the building process. This includes helping the customer through the entire color section, floor plan selection and modifications and much more. We work with the customer to build a house from scratch, all while being upfront, honest and easy going. As a custom home builder, we allow our customers to choose what kind of plan, change the layout, bring in their own house plans or ideas and choose from our selections of flooring, cabinets, countertops and more. We revolve everything around the customers and do our best to fulfill their wants and needs in their homes. There are many great homes that are currently on the market, but we pride ourselves in building our customers newer and better homes. We have done so for more than 20 years and have made a lot of happy customers and friends along the way. We truly believe building a home is the way to go.